You have to take only a couple of business trips or vacations with a 6-pound laptop in tow before you start thinking about switching to a PC with a little less meat on its bones. Although 14- and 15-inch all-purpose laptops are abundant and often inexpensive, just throw one into your backpack or briefcase and lug it around for a few days--your shoulders will soon beg for mercy. These days, fortunately, you can find plenty of laptops on the market that are slimmer, lighter, and more powerful than almost anything that you could have bought just a few years ago. What qualifies as a "lightweight laptop"? We drew the line at 4 pounds. There's a marked difference in design, features, and feel between laptops under that weight and their heavier friends. It may not seem like much, but a pound or two can make a big difference. Consider the heft of a pint of water: 1 pound. The difference between the lightweight laptops featured here and your run-of-the-mill 5.5-pounder is the equivalent of two (or two-and-a-half) extra pints of water in your laptop bag. It gets tiresome pretty fast. Of course, laptops that are more Olive Oyl than Bluto come with a few compromises. Giving up weight can mean giving up performance, battery life, and certain other capabilities. Most laptops that weigh less than 4 pounds lack optical drives, so forget about burning DVDs or watching Blu-ray movies without an external USB drive. They also tend to be thinner, leaving less room for larger, longer-running batteries, and for heat sinks and fans to dissipate the heat from high-power processors, which in turn means limited processing power. Nor is there room for a high-power discrete graphics card, so gaming enthusiasts are out of luck. Finally, expect to pay a little more for a thin-and-light laptop, relative to the performance received. Sure, you can find cheap laptops under 4 pounds, but at any given price, you'll get more performance, storage space, and features if you're willing to deal with some extra weight. Truly light laptops rarely have a screen larger than 13 inches, but they otherwise come in a variety of styles, sizes, and prices. If superslim is your preference, look no further than the Samsung Series 9, the latest PC to seriously challenge Apple's MacBook Air for slim-computing dominance. Business users especially interested in usability will want to focus on the ThinkPad X220, which maintains Lenovo's excellent, long-running standards for keyboard quality and management features. And for the more style-minded among us, Lenovo has a sleeker unit in the IdeaPad U260. Meanwhile, Sony's Z-Series VPC-Z137GX/S is a pricey alternative aimed at business executives who want it all, including a decent discrete graphics chip. If you're on a tighter budget, the tiny size of Lenovo's ThinkPad X120e netbook should fit the bill. It's powered by AMD's Fusion E-series processor, giving it performance that's a step above the typical Intel Atom-powered netbook. Let's look at these ultralight laptops in alphabetical order. 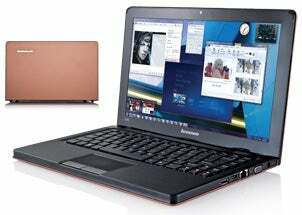 Lenovo IdeaPad U260: With its copper (or “mocha brown”) cover, this IdeaPad could be a contender for design awards. Despite generations of sober-looking, utilitarian forebears and a name that suggests a bad World War II submarine movie, Lenovo's $1199 IdeaPad U260 goes where the company's laptops never went before--into the queue for style and design awards. And the U260 gives Apple and Sony something to think about. When closed and viewed from the back, with its dark copper shell (Lenovo calls the color "mocha brown") covering the black main body, this 0.75-inch-thick ultraportable laptop resembles an extravagantly bound book- or pad-holder. When opened, the IdeaPad U260 presents you with an all-black, minimally populated keyboard deck consisting of a smallish power button, an ambient light sensor that adjusts display brightness automatically, a tiny OneKey system recovery button (accessible only if you use a pointy object), the best Chiclet-style keyboard I've ever typed on, and an equally elegant touchpad with smooth-operating buttons. In a break with tradition, Lenovo does not include an eraserhead or nubbin pointing device. Gaming frame rates on our test machine were in the teens (or worse), owing to Intel's integrated graphics. On the other hand, every video we tried played smoothly, even at 1080p. Audio quality is so-so, and rather quiet through the speaker. Your connection options consist of two USB 2.0 ports, VGA and HDMI video outputs, an AC jack, a gigabit ethernet port, and a single combination microphone/headphone jack. The laptop has no internal optical drive, and the wireless is 802.11n. Lenovo includes 64-bit Windows 7 Home Premium as the operating system, but no productivity software. You also get a VeriFace facial recognition utility that's quite cool, as well as a shock sensor and the CyberLink Webcam utility. The U260 is an average performer overall, but its top-of-the-line ergonomics more than compensates for that. My main disappointment is the lack of an option for a faster hard disk or a solid-state drive, to improve performance.